When refering to evidence in academic writing, you should always try to reference the primary (original) source. That is usually the journal article where the information was first stated. In most cases Physiopedia articles are a secondary source and so should not be used as references. Physiopedia articles are best used to find the original sources of information (see the references list at the bottom of the article). If you believe that this Physiopedia article is the primary source for the information you are refering to, you can use the button below to access a related citation statement. The anterior cruciate ligament (ACL) is important for maintaining stability of the knee joint, particularly in activities involving weaving, pivoting or kicking. The knee becomes unstable with a ruptured ACL and the joint may become more damaged over time. ACL reconstruction is the surgical treatment of choice. The majority of patients fall between these two sets of criteria, therefore treatment should always be assessed for on an individual basis. The goals of reconstructive surgery are to restore stability and to maintain full active ROM. The functional stability provided by the normal ACL is both in resisting anteroposterior translation as well as rotational subluxation. Reconstruction techniques vary as do the graft materials which can be used. The option of surgical management can vary depending on the patient's symptoms and their level and type of activity. i.e. if their sport involves rotating movements. Conservative management is an option, but the long term prognosis isn't as favourable . There is no gold standard for reconstruction with different surgeons using different techniques and with outcomes of more recent techniques still inconclusive for long term results . Different techniques include arthroscopic vs open surgery, intra vs extra-articular reconstruction, femoral tunnel placement, number of graft strands, single vs double bundle and fixation methods. Extra-articular reconstruction has been used to address pivotal shift, initially at least, which is greater than that provided by intra-articular reconstruction, but lacks residual stability. Intra-articular became the method of choice, but it doesn't restore the normal knee kinematics. Double bundle is considered more anatomical and supportive especially during rotary loading reproducing anteriomedial and posteriolateral bundles using gracilis and semitendonosis as the single bundle method (of the AM portion) is reported to have rotator instability in the longer term,  For this goal it is essential that all ligaments and capsular restraints are isometric within a full ROM. The isometric function of the ACL is achieved by the configuration of its 2 fibre bundles, (anteriomedial and posteriolateral) and their attachments. The ACL is not a single cord and has bundles of individual fibres which assume spiral configuration and fan out over broad attachment areas. Due to its complex structure, ligament attachment sites should not be altered during reconstruction.. In the 1970s and 1980s the extra-articular procedure was commonly performed for anterior tibial subluxation to eliminate any pivot shift, initially at least, but has lost favour due to residual instability and the later development of degenerative changes. It has used in isolation or to augment an intra-articular reconstruction. Intra-articular reconstruction became the preferred choice but it does not fully restore knee kinematics by creating a static restraint and was usually accompanied by connecting the lateral femoral epicondyle to Gerdy's tubercle with the collagenous restraint lying parallel to the intra-articular course of ACL. This also avoids the problem of lack of blood supply to the intra-articular reconstructions. Most of these procedures use the iliotibial band or tract connecting the lateral femoral epicondyle to the gerdy tubercle, The optimal attachment point for the extra-articular reconstructions for anterolateral rotatory instability is found to be the Gerdy tubercle. This procedure is also used primarily in conjunction with an intra-articular reconstruction when severe anterior instability is due to injury or late stretching of the secondary stabilising capsular structures or the lateral side of the knee. Diminish the anterolateral rotatory subluxation, but do not recreate the normal anatomy and function of the ACL. When used alone has a high rate of failure. The advances made in arthroscopy procedure have produced better results in ACL injury rehabilitation. This procedure may involve a small arthrotomy incision which preserves the vastus medialis obliqus muscle to the patella. This procedure can be performed with both endoscopic technique or double incision arthroscopic technique. Graft selection: The graft to be used depends on the length of surgery for. The most commonly used autograft is patellar bone graft and hamstring tendon graft (semitendinosus and gracilis). Diagnostic arthroscopy: preformed along with any necessary meniscal debridement or repair. Attention is given to partial thickness tears, displaced bucket handle tears and the status of the articular surfaces, including the patellofemoral joint. Graft Harvest: Mini incision extending from distal pole of patella to 2.5cm below the tibial tubercle is made to procure the graft. After retracting the other structures the graft to be taken is sharply outlined and micro oscillating saw blade is used to harvest the graft/bone plug. A triangle bone plug profile is usually obtained. Graft preparation: Graft is shaped into a 10mm tube shape for the femoral drill hole and 11mm tube for the tibial tunnel. Intercondylar notch preparation and notchplasty: Notchplasty is performed with 5.5mm burr from the anterior aspect of the intercondylar notch posteriorly and from distal to proximal and any residual tissue is also peeled off. Tissue is aggressively debrided with and arthroscopic shaver. If in the small intercondylar or notch area then further modifications are done. Tibial tunnel placement: Tibial tunnel should be placed so that the graft is not impinged by the roof of the intercondylar notch and should reside within the middle third of the former ACL insertion site. Femoral Tunnel placement: following a tibial tunnel placement, a femoral tunnel placement is completed so as to make a normal ACL like graft placement. Graft placement: The graft after the tunnel placement is slid along with arthroscopic grasper through the tunnel. Graft may be rotated before tibial fixation. Graft fixation: A Nitinol pin is then used to fix the graft with the bone and tunnel. The graft may be rotated before tibial fixation as a ACL has been shown to have external rotation within its fibres of approximately 90 degrees. The amount of graft tension created during fixation has a direct effect on ACL rehabilitation. Wound closure: Before closing, the graft harvest site is copiously injected with 0.25% Marcaine and it is also injected intra-articularly. The wound is closed with absorbable sutures with the knee in flexion. ACL reconstruction is one of the most common orthopaedic surgeries, and commonly there is articular cartilage degeneration. A total collateral ligament rupture and a full thickness cartilage lesion would be seen on an MRI. Hamstring tendon procedure: four layer, fold up of gracilis and the semitendinosus tendons. Surgery takes places at 10 weeks post injury. Double-bundle reconstruction:Semitendinosus is used with the autograft through 2 tunnels in both the tibia and femur. The autograft method is bone to bone with hamstrings/semitendinosus grafts. 3 tunnels may also be used, 2 tunnels through the tibia and 1 tunnel through the femur. For the bone to patella and tendon to bone graft, a couple of bone blocks from the patella and the tibial tubercle are taken. This procedure causes more anterior knee pain than the semitendinosus graft. In the second procedure, the graft is obtained from the distal end of the semitendinosus and the gracilis tendon. A kinematics study showed that the standard single bundle ACL reconstruction does not create the same kinematics as the intact ACL in normal activities. Only anteroposterior stability seems to be reconstructed. When the leg turns, there is an abnormal tibial rotation in the knee. Single-bundle ACL reconstruction does not recreate normal rotation in the knee. On the contrary, anterior translation after double bundle reconstruction was comparable with the intact ACL at 0° flexion, but the most stable position of the knee is at 15° and 75° flexion. The tunnel at the sagittal side of the knee goes to the cortex of the femur and the roof of the intercondylar notch. The tibial tunnel has to be first created in such a way as to prevent impingement of the grafts against the roof of the intercondylar notch. The tibial tunnel should be oriented at the Blumensaat line. This line goes from the tibial tuberosity and the posterior side should be oriented to the line of Blumensaat. Various tissues/graft have been used to anatomically reconstruct the torn ACL. Autografts taken from the patient's own body and include portions of the extensor mechanism , patellar tendon,iliotibial tract , semitendinousus tendon, gracilis tendon  and menisci . Allografts: grafts taken from cadavers..
Xenografts: grafts taken from animals. Bovine xenografts in particular have been associated with high complication rate . Synthetics: These can be further classified into 3 categories, biogradable (carbon fibers), permanent prostheses (Gore-Tex and Dacron) and ligament augmentation devices. The most commonly used are the autografts (patellar bone & hamstring) and sometimes the allografts. There is no consensus in the literature as to which provides the most stability  Each of these choices has advantages and disadvantages. When a patellar tendon graft is taken, the central 1/3 of the patellar tendon is removed (about 9 or 10 mm) along with a block of bone at the sites of attachment on the kneecap and tibia. Closely resembles the structures to be replaced. The length of the patellar tendon is close to that of the ACL and the bone ends of the graft can be placed in to the bony attachment points of the ACL. Early bone to bone healing is around 6 weeks. Bone to bone healing is considered to be stronger than soft tissue to bone healing as with a hamstring graft. Harvest site morbidity of Patellar_Tendinitis and anterior knee pain. Patellofemoral joint tightness with late chondromalacia. Injury to the infra-patellar branch of the saphenous nerve. With the improvement in the technique of the preparation of the multiple bundle graft, this graft choice has become more popular. 4 bundle graft is stronger and stiffer than the patellar tendon. No risk of anterior knee pain as with the patellar tendon. Pain in the immediate post-operative period is less. Graft harvest can be difficult especially in those with small muscles. Graft fixation to bone requires additional 'hardware' i.e. screws, endobutton. Graft healing of soft tissue to bone takes longer to heal, 10-12 weeks. Donor site morbidity. Patients may struggle to regain full strength of the hamstrings from which the donor was taken. Allograft is most commonly used in lower demand patients, or patients who are undergoing revision ACL surgery. Biomechanical studies show that allograft (donor tissue from a cadaver) is not as strong as a patient's own tissue (autograft). For many patients, however, the strength of the reconstructed ACL using an allograft is sufficient for their demands. Therefore this may be an excellent option for patients not planning to participate in high demand sports such as football, basketball, etc. Graft preparation kills the living cells decreases the strength of the tissue. Longer graft to bone incorporation time. Many surgeons have a preferred technique for different reasons. The strength of patellar tendon and hamstring grafts is essentially equal. There is no right answer as to which is best, at least not one that has been proven in orthopaedic studies. The strength of allograft tissue is less than the other grafts, but the strength of both the patellar tendon and hamstring tendon grafts exceed the strength of a normal ACL. Successful anterior cruciate ligament reconstruction is dependent on a number of factors including: patient selection, surgical technique, postoperative rehabilitation, and associated secondary restraint ligamentous instability. Errors in graft selection, tunnel placement, tensioning, or fixation methods chosen may also lead to graft failure. The comparison studies in the literature show that the outcome is similar regardless of the graft choice. The most important aspect of the operation is tunnel placement and the choice of graft is incidental. All tests for knee stability favoured patellar tendon grafts. Conversely, people had more anterior knee pain and discomfort with kneeling after patellar tendon reconstruction. After patellar tendon reconstruction, more people had some loss in their ability to straighten their leg. In contrast, more people had some loss in their ability to flex their leg after hamstring tendon reconstruction. A more recent study concluded that "ipsilateral autograft continues to show excellent results in terms of patient satisfaction, symptoms, function, activity level, and stability. The use of HT autograft does, however, show better outcomes than the PT autograft in all of these outcome measures. Additionally, at 15 years, the HT graft reconstructed ACLs have shown a lower rate of radiological osteoarthritis . What is the Best Graft Choice for ACL Reconstruction? ↑ Warren RF,Marshell JL,Girgis F: The prime static stabiliser of the medial side of the knee,J Bone Joint Surg 56A:665,1974. ↑ Arms S et al:Strain measurement in the medial collateral ligament of the human knee: an autopsy study,J Biomech 16:491,1983. ↑ A. L. Dodds, C. M. Gupte, P. Neyret, A. M. Williams, A. A. Amis Extra-articular techniques in anterior cruciate ligament reconstruction A LITERATURE REVIEW J Bone Joint Surg Br 2011;93-B:1440–8. ↑ Campbell's operative orthopaedics; vol.3: tenth edition. Mosby publication. ↑ Clacy WG:Anterior cruciate ligament functional instability:a static intra-articular and dynamic extra articular procedure, Clin Orthop 172: 102,1983. ↑ Clancy WG et al: Anterior cruciate ligament reconstruction using one third of the patellar ligament, augmented by extra-articualar tendon transfers,J Bone Joint Surg 64A:352,1982. ↑ Galway HR,Maclntosh DL:The lateral pivot shift:a symptom and sign of anterior cruciate ligament insufficiency, Clinc Orthop 147:45,1980. ↑ Hey-Groves EW: The crucial ligaments of the knee joint:their function, rupture and the operative treatment of the same,Br J Surg 7:505,1920. ↑ Cho KO:Reconstruction of the anterior cruciate ligament bye semitendinosus tenodesis,J Bone Joint Surg 57A:608,1975. ↑ Horne JG,Parsons CJ:The anterior cruciate ligament:its anatomy and a new method of reconstruction,Can J Surg 20:214,1977. ↑ McMaster JH,Weinert CR,Scranton P:Diagnosis and management of isolated anterior cruciate ligament tears:a preliminary report on reconstruction with the gracillis tendon,J Trauma 14:230,1974. ↑ Collins HR et al:The meniscus as a cruciate ligament substitute,J Sports Med 2:11,1974. ↑ Chick RR,Jackson DW:Tears of the anterior cruciate ligament in young athletes,J Bone Joint Surg 60A:970,1978. ↑ Indeicato PA.Linton RC,Huegel M: The results of fresh frozen patella tendon allografts for chronic anterior cruciate ligament deficiency of the knee,Am J Sports Med 20:118,1992. ↑ Galway HR,Maclntosh DL:The lateral pivot shift:a symptom and sign of anterior cruciate ligament insufficiency,Clinc Orthop 147:45,1980. ↑ Cho KO:Reconstruction of the anterior cruciate ligament by semitendinosus tenodesis,J Bone Joint Surg 57A:608,1975. 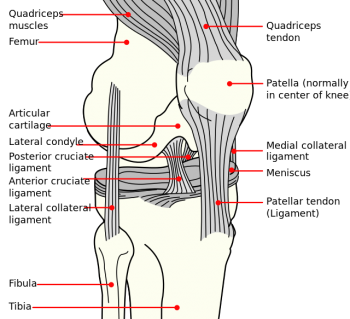 ↑ Collins HR et al:The meniscus as a cruciate ligament substitute, J Sports Med 2:11,1974. ↑ Van Steenel CJ et al:Failure of anterior cruciate ligament reconstruction using tendon xenografts,J Bone Joint Surg 69A:860,1987. ↑ Johnson. Graft Choice for ACL Reconstruction. International Society of Arthroscopy, Knee Surgery and Orthopaedic Sports Medicine. ↑ Mohtadi NGH, Chan DS, Dainty KN, Whelan DB. Patellar or hamstring tendon grafts for ACL reconstruction in adults. Cochrane Summaries.